I've never been exposed to Greek food as much as I have been lately, since moving to Phoenix. Seriously, it seems like there is a fantastic Greek place 3 miles in every direction of my work. 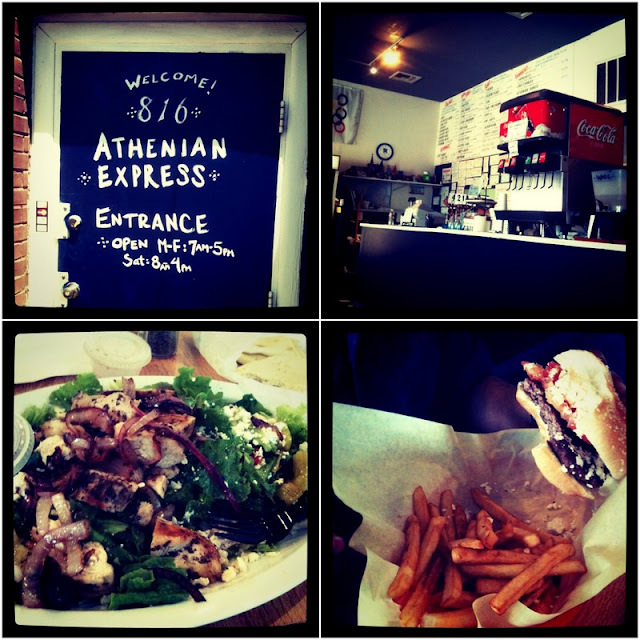 My favorite out of all of the restaurants is Athenian Express. We always try to check out new places, but seem to find ourselves choosing a trip to Athenian over wandering the city to track down a new cafe. When you order from this restaurant, you should expect a LOT of food. Prepare to bring a box out with you. The salads are served on a platter, and the burgers overflow with toppings, from grilled onions to an impressive pile of feta. I'd love to see their reserve of feta in the kitchen. It seems like there's a pound per menu item, they must go through more than I've eaten in my life...in a week! This love of Greek spurred me to make some Tzatziki at home. Who would have known it was so easy, and surprisingly tasted just like the dipping sauce I get with my chicken feta salad at Athenian! Tasty. -Combine all in a food processor. Let chill for at least an hour for the flavors to combine, before serving. -Great for veggie dip, chicken, sandwiches, meat & more! I love Athenian's! It is the best little gem in downtown in my opinion. I'm a friend of the owners and they are just the most wonderful people. My top two favs are the chicken feta salad and the chicken souvlaki. We should do lunch there one day! Yes we should! I'd love that.